Gastronomy is the study of the relationship between food and culture, the art of preparing and serving rich or delicate and appetizing food, the cooking styles of particular regions, and the science of good eating. One who is well versed in gastronomy is called a gastronome, while a gastronomist is one who unites theory and practice in the study of gastronomy. Practical gastronomy is associated with the practice and study of the preparation, production, and service of the various foods and beverages, from countries around the world. Theoretical gastronomy supports practical gastronomy. It is related with a system and process approach, focused on recipes, techniques and cookery books. Food gastronomy is connected with food and beverages and their genesis. Technical gastronomy underpins practical gastronomy, introducing a rigorous approach to evaluation of gastronomic topics. Etymologically, the word "gastronomy" is derived from Ancient Greek γαστήρ, gastḗr, "stomach", and νόμος, nómos, "laws that govern", and therefore literally means "the art or law of regulating the stomach". The term is purposely all-encompassing: it subsumes all of cooking technique, nutritional facts, food science, and everything that has to do with palatability plus applications of taste and smell as human ingestion of foodstuffs goes. Gastronomy involves discovering, tasting, experiencing, researching, understanding and writing about food preparation and the sensory qualities of human nutrition as a whole. It also studies how nutrition interfaces with the broader culture. Later on, the application of biological and chemical knowledge to cooking has become known as molecular gastronomy, yet gastronomy covers a much broader, interdisciplinary ground. 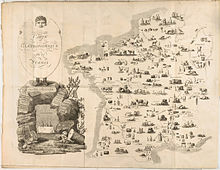 This is the first example of a carte gastronomique, a map that summarizes a country by its products at the outset of the "Cours Gastronomique" by Charles Louis Cadet de Gassicourt (1809). The culinary term appears for the first time in a title in a poem by Joseph Berchoux in 1801 entitled "Gastronomie." Pascal Ory, a French historian, defines gastronomy as the establishment of rules of eating and drinking, an "art of the table," and distinguishes it from good cooking (bonne cuisine) or fine cooking (haute cuisine). Ory traces the origins of gastronomy back to the French reign of Louis XIV when people took interest in developing rules to discriminate between good and bad style and extended their thinking to define good culinary taste. The lavish and sophisticated cuisine and practices of the French court became the culinary model for the French. Alexandre Grimod de La Reyniere wrote the first gastronomic work Almanach des gourmands (1803) elevating the status of food discourse to a disciplined level based on his views of French tradition and morals. Grimod aimed to reestablish order lost after the revolution and institute gastronomy as a serious subject in France. Grimod expanded gastronomic literature to the three forms of the genre: the guidebook, the gastronomic treatise, and the gourmet periodical. The invention of gastronomic literature coincided with important cultural transformations in France that increased the relevance of the subject. The end of nobility in France changed how people consumed food; fewer wealthy households employed cooks and the new bourgeoisie class wanted to assert their status by consuming elitist food. The emergence of the restaurant satisfied these social needs and provided good food available for popular consumption. The center of culinary excellence in France shifted from Versailles to Paris, a city with a competitive and innovative culinary culture. The culinary commentary of Grimod and other gastronomes influenced the tastes and expectations of consumers in an unprecedented manner as a third party to the consumer-chef interaction. The French origins of gastronomy explain the widespread use of French terminology in gastronomic literature. Gastronomic literature, Pascal Ory criticizes, is conceptually vague relying heavily on anecdotal evidence and using confusing, poorly defined terminology. Despite Ory’s criticism, gastronomy has grown from a marginalized subject in France to a serious and popular interest worldwide. The derivative gourmet has come into use since the publication of the book by Brillat-Savarin, The Physiology of Taste. According to Brillat-Savarin, "Gastronomy is the knowledge and understanding of all that relates to man as he eats. Its purpose is to ensure the conservation of men, using the best food possible." Apicius: A 5th century collection of Roman recipes by the gourmet Marcus Gavius Apicius. Contains instructions for preparing dishes enjoyed by the elite of the time. Suiyuan shidan (隨園食單) : An 18th century manual on Qing dynasty Chinese Cuisine by the poet Yuan Mei, which contains recipes from different social classes at the time along with two chapters on Chinese gastronomic and culinary theory. The Physiology of Taste: A 19th century book by lawyer and politician Jean Anthelme Brillat-Savarin that defined classic French cuisine. The work contains a large collection of flamboyant recipes from the time, but goes into the theory on preparation of French dishes and hospitality. ^ Cailein Gillespie; John Cousins (23 May 2012). European Gastronomy into the 21st Century. Routledge. p. 4. ISBN 978-1-136-40493-1. ^ "What the Hell is Gastronomy, Anyway?". adventures of an omnomnomnivore in NYC. 2011-05-13. Retrieved 2018-01-17. ^ Lilholt, Addison (2015). Entomological Gastronomy. Lulu.com. ISBN 1312792469. ^ a b c Ory, Pascal (1996). Realms of Memory: Tradition. Columbia University Press. pp. 445–448. ^ Montagné, Prosper. Larousse gastronomique: The New American Edition of the World's Greatest Culinary Encyclopedia. Edited by Jennifer Harvey Lang. New York: Crown, 1988. Second English edition. 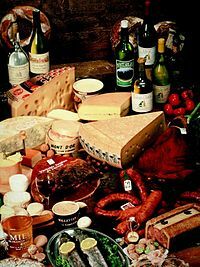 ^ "Gastronomic Meal of the French - UNESCO"Inscribed in 2010 (5.COM) on the Representative List of the Intangible Cultural Heritage of Humanity. Addison, Lilholt. "Entomological Gastronomy." Google Books. Lulu.com, n.d. Web. 07 Mar. 2016. Avi, Schlosburg. "What Is Gastronomy?" Gastronomy at BU. Gastronomy at BU, 6 June 2011. Web. 07 Mar. 2016. Brillat, Savarin. "The Physiology of Taste, by Brillat-Savarin." : Part8. The University of Adelaid, n.d. Web. 07 Mar. 2016. Crystal, Cun. "What the Hell Is Gastronomy, Anyway?" Crystal Cun. Wordpress, 13 May 2011. Web.07Mar.2016. Montagné, Prosper. Larousse gastronomique: The New American Edition of the World's Greatest Culinary Encyclopedia. Edited by Jennifer Harvey Lang. New York: Crown, 1988. Second English edition. Leanna, Garfield. "These Molecular Gastronomy Dishes Look Weirdly Delicious - and They're Selling out in DC." Tech Insider. N.p., 12 Feb. 2016. Web. 16 Mar. 2016. "Molecular Gastronomy – The Food Science." Splice. N.p., 24 Sept. 2015. Web. 16 Mar. 2016. Michael, Symons. "Gastronomy." Meals Matter. N.p., 17 Mar. 2015. Web. 07 Mar. 2016. "What Is Gastronomy?" Gastronomy at BU. N.p., 6 June 2011. Web. 16 Mar. 2016. This page was last edited on 13 December 2018, at 15:00 (UTC).